POSITIONS STILL AVAILABLE FOR SUMMER AND FALL PROGRAMS. Why Choose The New England Renegades? I am a former player of the New England Renegades and am in my third year of playing professional hockey. Currently, I am with the Kalamazoo Wings of the ECHL but, have also played for the Alaska Aces (ECHL) and the Manitoba Moose (AHL). Prior to playing professionally, I played division one hockey at Bentley University for four years where I received an athletic scholarship for hockey. Before attending college and like many players today, I played junior hockey. I played for the Boston Junior Bruins for two years. In order to reach the level of hockey where I compete at today, I had to have a certain knowledge and understanding of the game and the work ethic to compete. This was instilled in me by Coach Brun when I played for the New England Renegades every offseason. Coach Brun was able to teach me how to play the game the way it’s supposed to be played. The way he teaches the game is how it is played at the professional level. Coach Brun runs an excellent program and has the skills to develop players to get to the next level. I believe that a lot of my success is due to the New England Renegades and Coach Brun. Many kids who play high school hockey are still looking to play hockey during the summer and/or fall to stay in shape with hopes of getting a leg up on their adversaries. But playing hockey in the off-season should be more than just playing games with little or no practice. The off-season is a time to work on strength and conditioning as well as enhancing skill sets. But what about enhancing their Hockey IQ or in other words, their knowledge and understanding of the game of hockey? We believe that enhancing skill sets without enhancing the Hockey IQ is like building a house without a foundation. The house may look fine structurally and esthetically, but the house is still structurally unsound. In hockey parlance, being able to skate real well, pass the puck on a dime and shoot the puck like a sniper is great, but not knowing how to use these skills to the utmost is a total waste of these skills. What makes The New England Renegades different/unique? When we instruct players on techniques, concepts and strategies, we also instruct them on how their opponents (forwards – defenseman, defenseman – forwards) are instructed to play or should have been instructed. This way, our players can use this information against their opponents to their own advantage. We also cross-train players because during an actual game, a scenario may arise where a player may need to play out of position for a few moments or so, this is what we refer to as "interchangeable positioning". Being able to play multiple positions is also very advantageous for the individual player and their respective team. We also like to push our players out of their comfort zones. Our teams play in the Summer High School league (Tier 1) and when playing in tournaments, they play in the Jr. Midget (Midget Major – 17, 18 and 19 year old) division. For younger aged players this can become taxing, but in the past, many of our players have risen to the occasion and have been able to excel for their respective high school teams because of this experience. We like to provide our players with as much information as possible; documents and/or visual. We believe that any information, no matter how minute, is of great value to their training. Hockey, like any other sport, is composed of many small details. The players and teams which take care of the smallest of details are the players and teams which are most likely to become successful. Many of our past "successful" players have become high-school all-stars. Some players have advanced to the Junior level of hockey and some have gone on to play at the college level. We are very dedicated in trying to prepare our players for the next possible level of hockey available to them. Do our teams win over the Summer and/or Fall? Yes and no. We do not evaluate our program and players on wins and losses. Life is difficult enough for players without the stress of having to win all of the time. For our program and players, we are more concerned with "success". Success for us means that a player’s confidence, physical and mental play is increasing day by day, practice by practice and game by game. Being able to compete or being competitive against better talented and/or more experienced teams is foremost for our program. Nothing builds a player’s confidence more than knowing that they can compete against bigger, better and more experienced competition. Why haven’t you ever heard of the New England Renegades before? At present, we do not do much advertising. Most of the players and parents hear about our program by word of mouth. We also try not to do too much talking about our program. When a prospective player or parent wants to know about our program, we ask current and/or past parents and players to contact the parent or player in question and let those parents and players describe their experience with our program. Every player who participates in our program becomes part of our family and this is what we are most proud of. Many former players have come back to the Renegades to offer help with coaching or have asked to skate with the current team to stay in shape. All former players are always welcome to skate with the current team at any time. 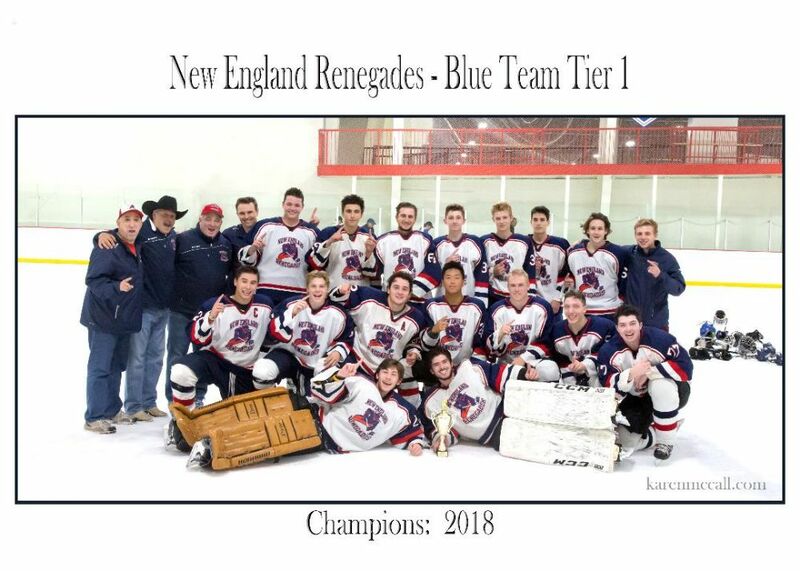 We are very passionate about the game of hockey, coaching and more passionate about the players who are part of The New England Renegades. For us, seeing every player succeed in achieving their goals is an experience that we cannot describe. To use an old quote; "Bring a man fishing and he eats for a day, teach a man to fish and he eats for the rest of his life."